Depending on your perspective, the holidays can either be a joyful time shared with family and friends or a dismal demonstration of unrealized expectations. The choice is yours. Abundance is everywhere, if you choose to look for it. In my annual Yoga of Thanksgiving class this past Thursday, twenty-two students and I reflected on the concept of abundance: what it means to us, how we can create more if it and how we can share it with those around us. Our practice included over an hour of movement, but that was the least of it; meaningful practice tugs more at the heart than the hamstrings. Today, I’d like to share some quotes, breath practices, and meditations we explored. Remain at that lengthened breath for several minutes. With each inhale, imagine abundance in all its forms entering your heart. With every exhale, imagine those same qualities flowing through your body and taking root in every cell. After several minutes, return your breath to a normal rhythm. Carry the energy of this breath practice to meditation. First Meditation Question: How can I invite abundance into my life, regardless of my material wealth? After six breaths at that lengthened breath, add a two second pause after both the inhale and the exhale. Remain at this breath for several minutes. With each inhale, imagine abundance in all its forms entering your heart. In the pause after inhale, imagine abundance completely filling you. With every exhale, offer abundance back to the world. In the pause after exhale, imagine abundance both within and around you. After several minutes, release the pauses, but continue breathing with a lengthened inhale and exhale. Second Meditation Question: How can I create abundance in the lives of those around me? 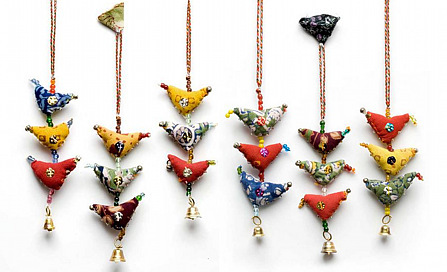 At the end of class, each student chose a string of prosperity hens that was crafted by artisan women in India. Hens symbolize prosperity in Indian culture, because any family fortunate enough to own a hen has a continual source of nourishment. I hope the hens will remind each student to be grateful and generous in the season ahead. I hope this practice does the same for you. Come visit Whole Life Yoga in Seattle, and join me in our special New Year’s Yoga Celebration! This entry was posted in Breath, Gratitude, Meditation on November 26, 2012 by Tracy Weber. I have spent every spare moment for the last year and a half writing my first yoga mystery, Murder Strikes a Pose. My husband and dog can both attest to my writing obsession, as well as the sacrifices they made so I could pursue it. I offered my novel to the universe last Tuesday. To be more specific, I e-mailed it to several prospective agents. As I hit the SEND button, I was struck by the parallels between writing and yoga. Both have been inexorable parts of my life this last year. My personal yoga practice kept me balanced and opened my mind to creativity. Teaching yoga kept me grounded in what was truly important. Writing allowed my mind and imagination to fly free. If you’re like me, your yoga practice ebbs and flows. Sometimes it’s part of your daily routine; sometimes it falls off the radar for weeks at a time. Sometimes you leap onto your mat with the joy of a child holding a bright green lollipop; other times you drag yourself there like a fifty-year-old en route to her first colonoscopy. And that whole idea of not being attached to the results? Well, good luck with that. But as usual, the sutras offer wisdom, for both yogis and writers. Put simply, the ancient teachings are right. Asana done once a month or even once a week gives anemic results, and the benefits of daily practice quickly dissipate when discontinued. Without dedication, yoga practice becomes nothing more than exercise, and not very effective exercise at that. On the other hand, if we hold preconceived attachments to the results of our practice, we simply give up. Writing offers many parallels. I wrote the first two chapters of my book over three years ago, then let it sit for almost two years. Until I worked on it daily for over a year, I made no progress. And on the days I lacked dedication and enthusiasm, my words were no more than crumpled pages at the bottom of my recycle bin. As for attachment to results, well, I have to let that go, or I’ll never make it past my first rejection, sure to come any day now. Any writer attached to success lasts about three minutes before laughing maniacally, tossing her computer out the window, and popping popcorn over the manuscript burning in her fireplace. So why continue? I practice both yoga and writing because word by word, pose by pose, both offer unexpected gifts: flashes of self-understanding, moments of quiet calm, a connection to laughter and joy in this sometimes challenging life. These small gifts make all the rest worth it. Like many of my students, my yoga and writing practices both wax and wane, and my larger goals often seem unattainable. I’m more likely to become a bestselling author than attain enlightenment in this lifetime, and neither is very darned likely. But the simple act of practicing serves me, nonetheless. So if you need me, I’ll be teaching at the studio or typing at my keyboard—persevering. 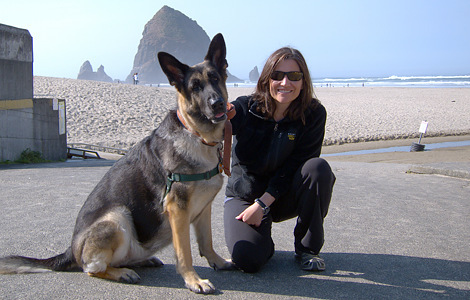 This entry was posted in dogs, writing, Yoga Philosophy on November 19, 2012 by Tracy Weber. Happy 75th Birthday TKV Desikachar! Anyone want to go to France in October of 2013? If so, I have the perfect excuse—TKV Desikachar’s 75th birthday celebration. For those of you who aren’t familiar with TKV Desikachar, he is the son of T. Krishnamacharya, who was the key lineage bearer of the Viniyoga principles in our lifetimes. He started his professional life as an engineer with little interest in yoga. He has been a yoga teacher using his father’s principles since the 1960’s. He is totally devoted to the teachings of his father, T. Krishnamacharya. He pioneered the use of line drawings (aka stick figures) as a short hand for documenting yoga sequences. He showed how modifications (adaptations) of yoga asanas could help yoga be truly adapted to the needs of the individual. Desikachar is now working to pass his leadership role on to his son, Kaustub Desikachar, with whom I hope to take seminars in the future. The celebration of Desikachar’s 75th birthday in Porte Leucate, France, will include lecture, asana, pranayama, chant, and meditation in both English and French. I won’t be able to attend, but I hope some of you can, and if so, please bring me back lots of photos! To learn more, check out this web site. This entry was posted in Viniyoga on November 12, 2012 by Tracy Weber. This simple, relaxing breath can be used any time you want to soothe body, mind, and spirit. I taught it recently in my Yoga for Chronic Pain class, yet it reduces stress of any kind—physical, emotional, or spiritual. Lie on the floor, in bed, or any place else you can be comfortable without falling asleep. Your knees can be bent or draped over a bolster. If that’s not comfortable, you can also elevate your shins on a chair. Any position is fine, as long as it’s physically comfortable and your spine is in a neutral position. Notice the sensations of your body, without labeling them as “good” or “bad.” Just be present with those sensations. Surrender your weight into the earth and feel tension drain from your body. Place your hands on your stomach and consciously breathe as if you were breathing into your belly. Notice how your belly gently expands with every inhale and relaxes with every exhale. Invite your mind to be in this present moment, not concerned with the past, not worried about the future. Every time your mind wanders, simply bring it back to the feeling of the breath in your belly. After a minute or two, begin to lengthen your breath. Take several breaths to deepen each inhale and exhale, focusing primarily on a slow, complete exhale. When you find a rhythm that feels deep, yet smooth and easy, continue breathing at that length. If at any point you feel a sense of strain, shorten the breath again until you find a length that feels full, yet relaxing. When you’re ready to transition back to your day, begin with small movements, such as wiggling your fingers and toes or even yawning and stretching. Then roll to your side for a moment before gradually pressing up to sitting. discomfort. I hope you enjoy it! This entry was posted in Breath, Therapeutic Yoga on November 5, 2012 by Tracy Weber.